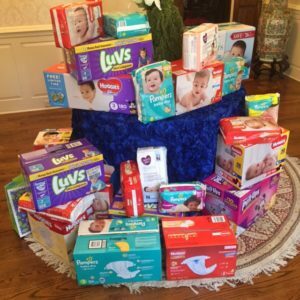 Junior League of Mobile Diaper Bank supports area families in need with diaper donations. Medicaid covers 1/3 of all births in the US but government programs don’t provide diapers – a basic need for babies and toddlers. Diaper needs impacts the physical and mental wellbeing of children. Most childcare centers require parents to provide a day’s supply of diapers – without this, babies can’t go to daycare, and their parents can’t go to work. A child who is sick due to poor diapering or one who is not allowed to attend daycare because their parent can’t afford diapers is deprived of a learning environment which leads to long-term impacts. Become A Diaper Sponsor Now!